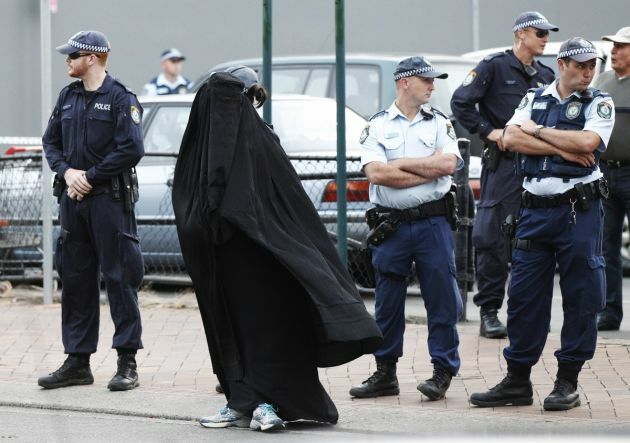 (Photo: REUTERS / Daniel Munoz)Police officers stand on guard next to a woman wearing a burqa near the venue where controversial Dutch member of parliament Geert Wilders will speak in the Sydney suburb of Liverpool February 22, 2013. Security at the function center was tight for Wilders, who speaks against the spread of Islam across the world. An Australian Muslim monitoring group says it has recorded 30 attacks against women wearing the hijab veil in three weeks since anti-terrorist raids swept Sydney in Australia. The Muslim Legal Network and Islamophobia Register recorded events ranging from a mother being spat on in western Sydney and a cup of coffee thrown at the car window of a woman driving in a hijab. The Age newspaper reported. One woman was also threatened with having her hijab torn from her head and set alight while a Muslim mother was verbally abused at a Melbourne playground. In Brisbane, a pig's head and cross were thrown into the grounds of a mosque. The state of Queensland recorded the highest rate of personal assaults and threats to mosques. The list goes on and Victoria state Police Chief Commissioner Ken Lay has heard anecdotal reports about Muslim members of the Melbourne community facing abuse. But he said that the police have no actual data of the events since the community is not reporting them. With this, he stressed that the guilty cannot be charged and there's no way to publicize the persecution that is happening. "It is very important for Victoria Police to become aware of these events so we can take decisive action," he said. Lay said that covered women are the usual victims of insult, threats, and assault. He regarded the attacks as cowardly as they assault the vulnerable. This observation was confirmed by Solicitor Lydia Shelly of the Muslim Legal Network. She said that the attacks are mostly on Muslim women who wear a scarf or a hijab in public places. "As a Muslim woman, I am very concerned that this is impacting on the rights or perhaps the freedom of movement for Muslim women, because they simply do not feel safe anymore," she said. Ertunc Ozen, chief executive of the Australian Turkish Advocacy Alliance warned that focusing on the attire of the Muslim women is like telling the youth that "they do not belong in this country and they never will."